(Nanowerk News) Arevo Labs, a Silicon Valley startup, announced the availability of technology and materials to create Ultra Strong High Performance Polymer parts using a 3D printing process. Supported materials include High Performance Polymers such as KetaSpire® PEEK, AvaSpire® PAEK, Radel® PPSU and PrimoSpire® SRP. 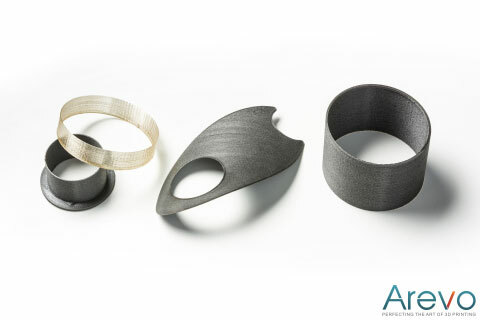 Arevo’s offering consists of Proprietary Carbon Fiber and Carbon Nanotube (CNT) Reinforced High Performance Materials, printing technology compatible with commercially available filament fusion 3D Printers and specialized software algorithms to create 3D objects with deterministic mechanical properties. 3D printed Ultra Strong Polymer Parts(TM) from Arevo Labs are lighter and stronger than similar products and combine excellent resistance to high temperatures and chemicals with unmatched mechanical properties. 3D Printing with PEEK and other advanced reinforced polymers has been technically challenging until now. Arevo Labs’ team has solved this problem by optimizing polymer formulations along with innovative extrusion technology to make them suitable for additive manufacturing. Arevo Labs patent pending 3D Printing technology combines the benefits of printing complex geometries with reinforced materials that have excellent resistance to high temperatures and chemicals. The 3D printed parts optimized for mechanical properties using Arevo’s advanced algorithms result in lighter stronger parts with unmatched mechanical properties. Arevo Labs, based in Silicon Valley, California, focuses on the development of technology to enable production grade 3D Printed Ultra Strong Polymer parts. Arevo’s technology consists of Advanced Materials, Printing Technology and Algorithms to optimize mechanical properties of printed parts. Arevo plans to offer the technology and materials to OEMs worldwide.